As a kid, the local candy store had three arcade machines and a pinball machine. It’s where I first played games like Altered Beast and Mortal Kombat. It’s also where I enjoyed Addams Family, Terminator 2, and other lauded pinball tables. Though they seemed old fashioned compared to the cutting edge of games like Mortal Kombat, the sound of metal against metal held an allure to this grade-schooler. Years later, the candy store ditched pinball altogether and I never used flippers ever again. Until this week. Pinball FX 2 VR is a new adaptation of the popular virtual pinball game for PlayStation VR and HTC Vive releasing in North America on November 29, though it has been available for some time on Oculus Rift. 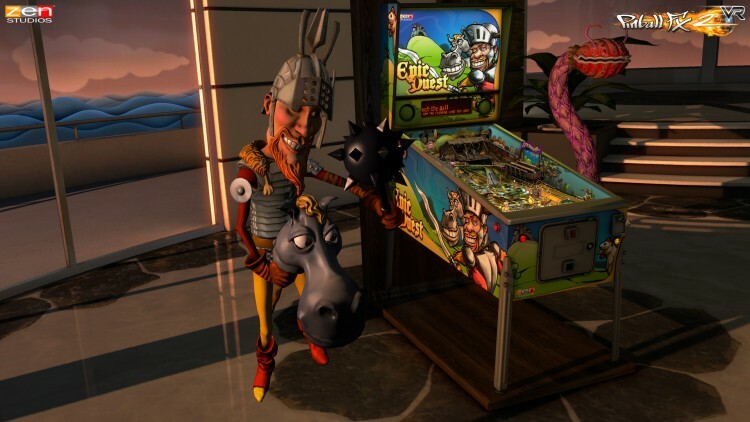 It is from Zen Studios and the tables featured here were in the company’s previous release Zen Pinball 2, a non-VR title. The biggest change is that they are now in virtual reality. And what a difference that makes. The game loads up and you are in a virtual house, another luxurious living space to rival the likes of Oculus Home. You have three pinball tables set up, a wall with trophies from the games, a gallery with scoreboards to compare your pinball wizardry with friends or other players worldwide, and an entertainment center that summarize the games, presents options, etc. You can switch out the three machines to whichever ones you prefer. And when you are done just looking around this virtual home, you can click on a machine and start playing it. Suddenly you and your invisible body are standing before a machine, taking in the colorful lights and exciting sounds. This large machine feels like it is there. You can glance around it or lean down into it for a better look at the images and labels. And then you play, using the Dualshock’s bumpers for the flippers, the left analog for rocking the machines (just avoid causing a Tilt error) and the right analog to pull back the ball launcher. There is a visceral quality to seeing the machine there in three dimensions, versus a flat screen on a flat monitor. Predictably, it makes it feel that much more like you are playing a real pinball machine. Graphically, the machines are detailed. The pixelated dot matrix displays are there in all their orange glory. Metal balls, ramps, and triggers all look quite convincing. On top of all this is a layer of effects (or should I say FX?) only possible in a video game. Polygonal characters move and walk around under the glass of the table, such as cowboys in the Wild West Rampage machine. Creatures also sit on top of machines, like the sheep from Castle Siege. The most overt example of these gaming graphics surround you and the pinball machines. When you are playing, the virtual home dims, so you can focus on the pinball, but the space around it fills with different visuals and sounds befitting the table. Mars has asteroids and spaceships. Paranormal has the Loch Ness Monster rising from an ocean. The new The Walking Dead machine has a life-sized Clementine on the left side, hiding from a grasping zombie on the right. These immersive graphics are a cool use of virtual reality, though they can distract you from the fast-moving ball and other action of the pinball games themselves. There is a good variety of tables to be had with this release. The game comes with three machines for $15: the science-fiction themed Mars, the sea adventure Secrets of the Deep, and the heroic fantasy Epic Quest. The Season 1 DLC, priced $25, includes five more tables: the supernatural themed Paranormal, the Mad Scientist-esque BioLab, the fantasy warfare of CastleStorm, the alien invasion of Earth Defense, and the self-explanatory Wild West Rampage. The machine based on Telltale’s The Walking Dead games is a separate download for $7. Each machine has some really unique features: the puzzle cube and haunted house of Paranormal, the roleplaying fight system of Epic Quest, the building and upgrading of a mutant in BioLab, the exciting events of Wild West Rampage, the giant robot that actually shakes the machine for Earth Defense, or the missions and moral choices of The Walking Dead. I found the Mars table the most pedestrian, but not bad by any means. All the tables have appropriate music and voices, from songs of adventure or suitably creepy atmospheric tunes, to the silly voice of the hero from Epic Quest or the confidence of the female bounty hunter of Wild West Rampage. Fans of all different genres have something to like in Pinball FX2 VR. And with The Walking Dead machine, you actually do missions and moral choices from the five episodes of the first season of that game. The voiced quotes from the characters you love are a nice touch as well. It all adds up to something followers of that series will appreciate. Undoubtedly fans of Pinball will be happy here. They get a faithfully made three-dimensional replication of their hobby, albeit spruced up with modern-graphics that defy real life, albeit intruding to the purity of it all as a whole. Novices to pinball should enjoy the games for sometime too, though the difficulty of pinball in general and the challenge of finding and trying all the events and missions in the games may discourage some. Regardless of player ability, the feel of virtually standing there and actually getting sore fingers after a few hours is something of an accomplishment. And you may find yourself surprised to be coming back for that thrill of activating multi-ball or hitting the jackpot in a game.